Paris, France: Editions Climat, 1992. Text/BRAND NEW. Illustrated softcover/NF w/trace edge & surface wear & very faint creasing to upper back corners. An unscholarly and sometimes very funny glossary of French musical slang --- mainly drawn from popular music - with definitions and usages presented in alphabetical order. "Sauciflard," for instance, is a "[m]orceau, souvent de choix, mais tant joue et rejoue que nul n'a plus envie de l'executer ... -- Les mecs, on a un marriage, dimanche! -- Y va falloir encoRe s'taper les sauciflards!" Also given are slang titles for pop and jazz standards "Sa Pine Molle" is Ellington's Satin Doll, and "Ma Gueule Sale" is Dresser's My Gal Sal. 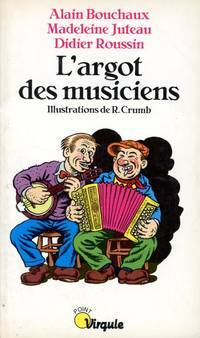 Given the sardonic, sometimes raunchy nature of the collection, American cartoonist Robert Crumb's (1943 -) two dozen or so illustrations are quite appropriate. 215 pages, with Avant-Propos, Remerciements, and References.. Reprint, 1994. Soft Cover. Near Fine/None as Issued. Illus. by Robert Crumb (Illustrator). French Language Softcover. Darmstadt: Wissenschaftliche Buchgesellschaft, 1981. EX-LIB/UNCIRCULATED. No loan pocket. Text/BRAND NEW. Linen softcover/VG. This is Band 150 in the publisher's collection Enträge der Forschung. The subject was the belligerant, devious, and opportunistic landowner who was also one of the greatest songwriters and poets of the early Northern Renaissance. 140 pages, with three [tables].. Soft Cover/Linen. Near Fine/None as Issued. German Language Softcover. New York, NY: United Artists Music Co, 1968. Text/As New. Illustrated soft cover/VG; Strong & sound w/sticker remanent & light soiling to rear. The 12 songs are: Acquarius, Donna, Ain't Got No, Air, I Got Life, Hair, Easy to Be Hard. Frank Mills, Where Do I Go?, What A Piece of Work Is Man, Good Morning Starshine, and The Flesh Failures (Let the Sunshine In).. First Thus. Paperback. Very Good/None as Issued. Illus. by Dagmar (Photos). Praha -- Bratislava: Editio Supraphon, 1965. Text/AS NEW, showing trace margin discoloration. Black linen boards/NF. DJ/VG w/light edge rubs & closed tears. 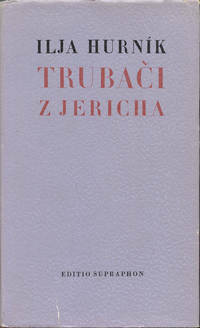 This lively volume of stories, parables, and vignettes by the Czech pedagogue and modernist composer is one of four printings of the Trumpets of Jericho, three by Supraphon, one subsequently by Melantrich. 147 pages, with Obsah.. 3. vydani, 1968. Hard Cover. New/Very Good. Czech Language Text. New York: W. W. Norton, 1974. Occasional essays on the history of music (mainly eighteenth century and before), and musicology by a Princeton professor. 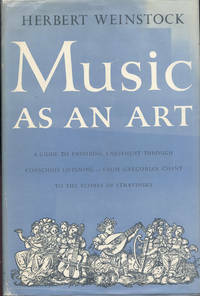 The chapter headings are: Erich Hertzmann; The Historical Aspect of Musicology; Sources and Problems for Graduate Study in Musicology; Vergil in Music; On the Date of the Marchetto da Padova; Church Polyphony apropos of a New Fragment at Grottafera; The Music of the Old Hall Manuscript - A Postscript; The ORDINARIUM MISSAE in settings by Dufay and Power; Origins of the L'HOMME ARME Mass; Relative Sonority as a Factor in Style-Critical Analysis; A Cypriot in Venice; Gugliermo Gonzaga and Palestrina's MISSA DOMINICALIS; Some Motet-Types of the Sixteenth Century; Haydn; Haydn's DIVERTIMENTI FOR BARYTON, VIOLA, AND BASS; Notes on a Haydn Autograph; Early Music Publishing in the United States; and Verdiana in the Library of Congress. Eighteen papers, 200 pages, with figures, halftones, and two Appendixes; plus xxii pages Contents, Foreword (by Lewis Lockwood), and Preface; erratum slip laid in. ExLib: markings are limited to bar code and strike-out on lfEP, reference card glued to rfEP and stamp on rfEP, pencilled location number on title page, and stamp on upper text edge. Covers show slight wear at backstrap, otherwise sound; text is strong, but the upper edges of pages 27-38 have been somehow crimped.. First Edition, First Printing. Black Boards. Very Good/No Jacket. 8 7/16" Tall. Monograph. Boston: D. C. Heath, 1887. While the typeface and condition of the book are consistent with the copyright date, this is almost surely a later printing. Included are 76 part-songs of the period ("If I had but Two Little Wings," "Picnic Glee," "Zephyrs Soft their Fragrance"), and 56 hymns and anthems ("Evening Hymn," "I will Lift up Mine Eyes," and "Walk in the Light"). Also included are some elementary vocal instructions, with emphasis on solfeggios, and simple piano accompaniments. 256 pages with Preface and Contents. ExLib: Markings are white ink DDSC code on backstrap, stamps, loan pocket, and date card on rfEP, stamps and pencil entries on title page and Preface, and bookplate on rrEP. Covers are bumped at corners, frayed at edges, grimed, and generally show wear and loss; text, apart from browning, and discreet pencil marks on pages 50-51, is clean and strong.. Paper Covered Boards. Good/No Jacket. 10 1/16 x 7 5/8. Manual. New York: Harcourt Brace & Company, 1953. Text/BRAND NEW & Bright. Blue linen boards/Fine. DJ/VG; sound, price-clipped, w/light wear; under mylar. 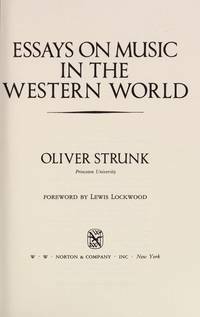 An historical survey of Western music by the author of "Chopin: The Man and his Music," "Handel," and "Tchaikovsky," and about what to hear when listening to that music. 334 pgs, in 21 chapters followed by Postlude. The composers and their works are placed within the context of the times in which they wrote, and the evolutions brought about by new techniques and instruments are discussed.. First Edition, First Thus. Hard Cover. Near Fine/Very Good. Vintage/Music Appreciation.